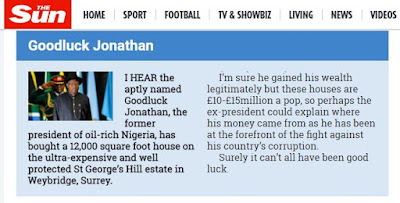 Former President Goodluck Jonathan has denied owning a £15m property in the United Kingdom. A former Editor of the UK SUN, Kelvin Mackenzie, had said in his weekly column on Saturday that Jonathan had bought a property in Surrey. 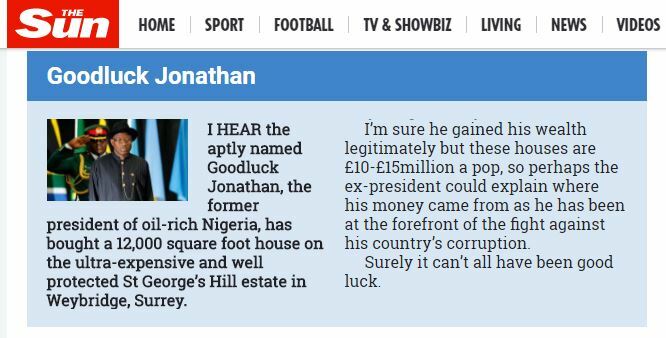 He had said, “I hear the aptly named Goodluck Jonathan, the former President of oil-rich Nigeria, has bought a 12,000 square foot house on the ultra-expensive and well protected St George’s Hill estate in Weybridge, Surrey. However, Jonathan, through his media aide, Mr. Ikechukwu Eze, denied the report and demanded a retraction from the newspaper. The statement read in part, “Nothing could be further from the truth. 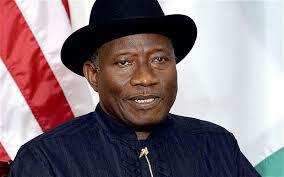 Dr. Goodluck Jonathan takes pride in the fact that he does not have any property or accounts outside Nigeria. He stated this publicly while in office and his commitment to Nigeria’s economy remains total even after he left power. “As the Nigerian President who signed the Freedom of Information bill into law, Dr. Jonathan is well aware that the United Kingdom is a nation with good record keeping at county and national levels and as such, it will not take a serious and responsible media long to verify ownership of property before rushing to the press with potentially libellous publications.